Lovely signs of fall: morning fog, the scent of damp moss, the first leaves are dropping, dewed cobwebs in the morning, toadstools and rose hips. 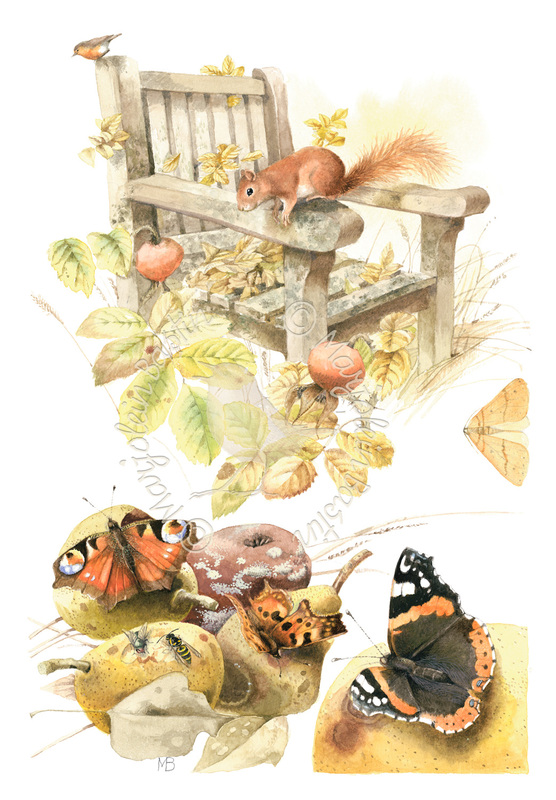 The Eurasian jays are hiding acorns, squirrels are stocking their winter food supplies, the wood mice are burying berries in their burrows. And while butterflies cannot eat, they certainly can drink. Their long rolled-up tongues work like a lemonade straw. During the summer months they drink nectar from the flowers, now they drink the juices from rotting apples and pears. Last night a Scarce Umber (Agriopis aurantiaria) was attracted by the light of my studio. In the Netherlands you will see them fly only in October and November. As I walk through the orchard I have to really watch where I’m stepping, there are numerous rotting apples in the grass. Of course they’re covered in wasps, flies and butterflies. Just last month these butterflies were seen only on the Sedum plants, now they have expanded their working territory to include the orchard.